I have a regular customer who loves loves LOVES my gingerbread biscotti! While he is Croatian, he has a poker party nearly every weekend, and his fellow players are mostly Italian…and Italians know good biscotti, letmetellyou. I am constantly informed of how GOOD these are, and that no matter how many dozen he buys, there are never any left over at the end of the evening. My father used to call this phenomenon “moreish”, as in when you eat something that is so tasty, you end up having a little bit more, and then some more, until they’re all gone. This recipe is one I developed specifically for this customer, and is one of two “go-to” favourites of his; the other favourite will be the topic for another post! 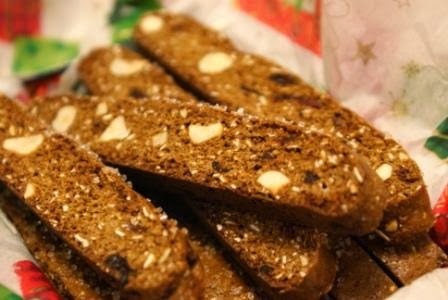 This gingerbread biscotti recipe can be made with or without nuts, but I usually make it without, since I am often pairing it with the other biscotti recipe that’s chock full of them! Don’t be nervous or afraid of making biscotti if this is your first time; they are essentially cookies, but baked twice so they dry out crisp and firm, which leaves them the perfect vehicles for dunking in your coffee or espresso to soften. The recipe below is a bit fiddly and involved, but most of the ingredients are spices and fruit, so once those are combined, it’s much easier. 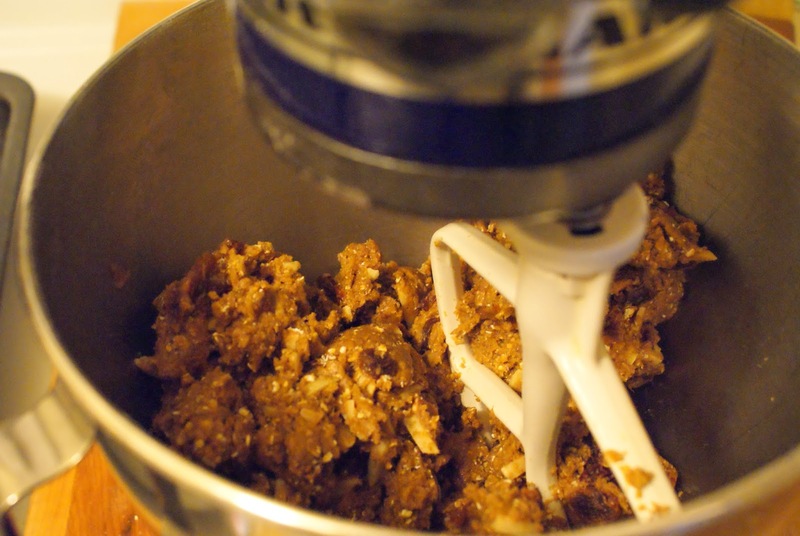 Don’t skip the processing of the rolled oats; this makes for a firmer cookie. Preheat oven to 350˚F and place the oven rack in the center of the oven. Line a baking sheet with parchment paper or a Silpat (silicone baking mat). In a food processor, finely grind ½ cup (50 grams) of the rolled oats. 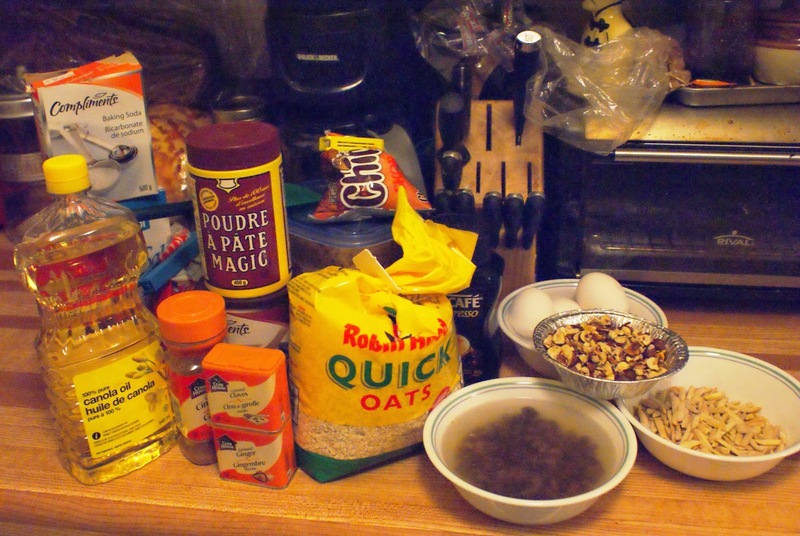 Combine the finely ground oats with the remaining whole oats and the other dry ingredients. Whisk together the eggs, molasses, oil, and vanilla extract in a separate bowl. Slowly add the egg mixture to the dry ingredients, and beat just until combined. Mix in the chopped mix-ins until just incorporated. Transfer the dough to a lightly floured surface and divide in half. Form each half into a flattened bar about 12” long and 5” wide. Transfer the bars to the prepared baking sheet, spacing at least 3” apart. Bake for about 30 minutes, or until golden brown on the edges and firm to the touch. Remove from oven, immediately brush the top lightly with beaten egg white, and sprinkle generously with sanding sugar; let cool on a wire rack for 10 minutes, or just long enough so you can hold the cookie bar for cutting without burning your fingers. Reduce oven temperature to 300˚F. 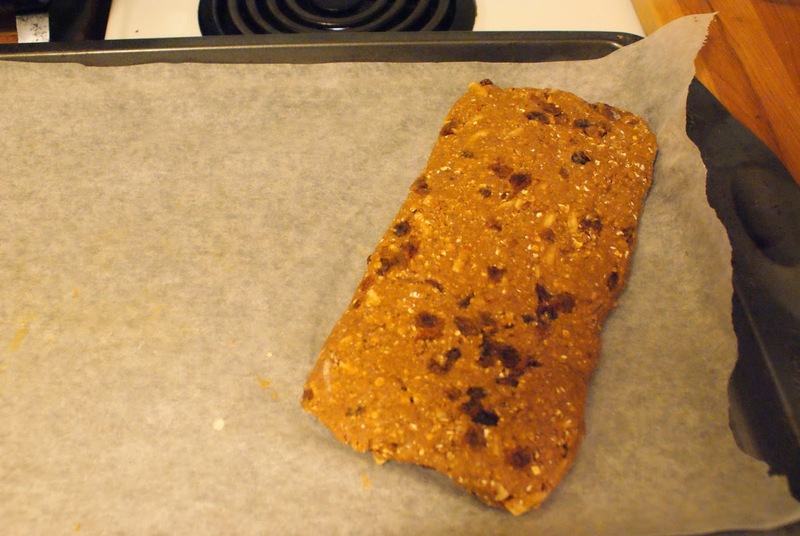 Transfer the partially cooled bars to a cutting board and cut into ¾” slices. 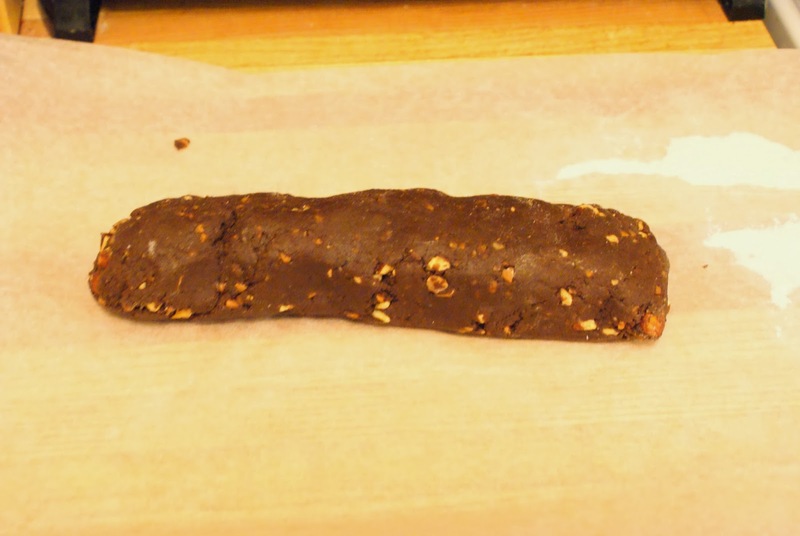 Place the biscotti back on the baking sheet face-up, leaving about ½” between each cookie. Bake for 6-8 minutes, rotate pan, and bake for another 8-10 minutes or until dry and firm. Remove and let cool completely.